Originally published in 1858. 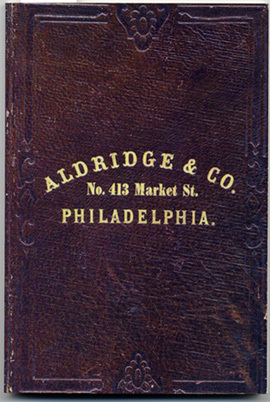 This is the catalog for a dry goods store in Philadelphia. While the products listed are not as extensive as a general store, they provide insight into what was available in a dry goods store as well as not only what people were wearing or using but the relative proportions as well. Items sold included hosiery, shirts, drawers, gloves, lace mitts, suspenders, combs, soaps, brushes, fishing tackle, and numerous other items. Just looking over some of the items listed make you want to dive into more research to find out the details of the item. For example, for men's drawers, there are: brown cotton, rough and dressed; brown gauze cotton; white merino; white gauze merino; grey merino; New Britain Co's and other Domestic wool and merino drawers; white cashmere; and, China and Novi spun silk. The note is also added: "The above are all made with the new shaped waistband and linen buttons." That list of different types of drawers definitely shows much more variety than are available in the reenacting community where plain white cotton are pretty much the standard. If we are to judge from the above listing of fabrics, plain white cotton or osnaberg drawers would not have been available. And I can't say I ever heard about men's drawers coming in silk. That item further stimulates the question as well about what is the difference between China and Novi spun silk? This book definitely poses more intriguing questions than it does answers but does give tremendous starting points for additional searches.